7 CDs. 8 hrs. Recorded Bks. Feb. 2018. $77.75. ISBN 9781501960802. digital download. Gr 9 Up—Fifteen-year-old Carly Fleming is still treated as an outsider by natives of Holcomb, KS, although it's been three years since she moved there from New York City. When the Clutter family is murdered in November 1959, Carly is determined to solve the mystery herself. 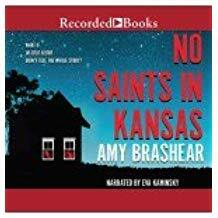 She enlists her few friends to help her look for clues in the Clutter farmhouse, sneaks into the police station to look for files, and even disguises herself to slip into the jailhouse to question a suspect. Bullying at school becomes worse for Carly, as does her home situation, when her father becomes the court-appointed lawyer for one of the defendants. This is the fictionalized version of the real-life Clutter murders, as seen through the eyes of a teenage girl. Truman Capote, who crafted the nonfiction account of the Clutter family murders in his magnificent book In Cold Blood, appears as a character, as does his friend Harper Lee. Eva Kaminsky narrates, reading in a brisk and dramatic fashion which reflects the emotional personality of the unreliable, and sometimes unlikeable, Carly. Other characters' voices are expressive and distinct. The pace is fast at times, and Kaminsky is able to keep listeners' focus. VERDICT This would be an additional purchase only, where historical fiction audiobooks are in high demand, or where In Cold Blood is of special interest.